Developed at the end of a quiet cul-de-sac in the incredibly desirable and convenient Enclave at Riverview on 2.08 lush and private tree framed, level acres, the magic of 3584 Reflecting Drive begins. The home and grounds admired from its origins of thoughtful planning to its architectural draw through its construction by master craftsman and custom home builder, William Baker. With a keen focus marked only by his passion as one of Atlanta's master craftsman of the high end custom market, every detail is sheer perfection, both inside and out. As beautiful as it is warm with heart of pine floors throughout, the artistically designed floating curved staircase welcomes guests from the foyer with the defining casual elegance of a grand comfort of home. Flanked by the gentlemen's study private flawlessly tucked away in the master wing with stone wood burning full masonry fireplace with gas logs - one of three, this inviting room becomes the perfect home office or individual get away. The greeting hall off entry foyer is filled with natural light from floor to ceiling windows where coat closets and the powder room are so strategically placed with genius consideration for their location when entertaining. The formal dining room is most approachable welcoming friends and family for casual meals as well as formal dining while opening to the morning room room overlooking its spectacular grounds of expansive flagstone patios, pool and outdoor living cabana and kitchen. 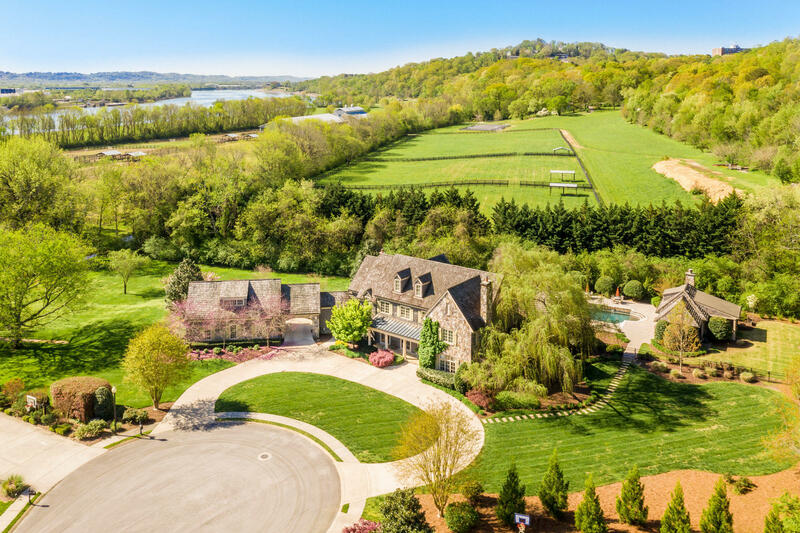 Backing to over 160 green acres of some of Chattanooga's richest riverfront property of Carter Farms, your escape becomes your daily state of mind when home. Flagstone patios, covered and uncovered surround the gunite, pebble tech salt water pool with spa in a resort quality privately encircled by its natural environment of its backyard. Morning room with washed knotty pine ship lap ceiling reflecting an abundance of light from its full wall of windows and doors to the kitchen and family room. Oversized space designed and decorated with the feel of a very cozy, intimate space surrounded by windows overlooking a sea of green privacy provided by its grounds. Stone fireplace warms the spacious family room that will easily accommodate all of the extended family members and more while crowned by its two story ceiling wrapped in washed knotty pine ship lap detail. The kitchen offers the best in dinner prep and cooking with Viking and SubZero and custom, funiture quality Woodmode cabinets that can also be found throughout all baths and the Butler's pantry. Master retreat is in a world of its own located on opposite wing of the main living area with entry hall opening to extraordinary outdoor living areas for rest, and recreation. All guest bedrooms are full suites with private baths and walk-in closets surrounding the second level sitting/game area. Offering media area filled with built-ins that easily doubles as the library with window seating for total relaxation of entertainment with a half bath. Third level was designed for complete play as the bonus area with window seats flanked by walk-in storage on each end. Fully encapsulated walk-in crawlspace is accessible from interior providing the perfect storm shelter, wine cellar or storage. The garage is every car lover's dream with three oversized individual bays. Full walk-up, unfinished room with windows over garage is perfect for expansion of an apartment or for everyday storage. Dreams do come true when your path leads you to 3584 Reflecting Drive.